The human spirit is the real person, the very core of a person’s being. It is composed of our intellect, emotions, fears, passions and creativity. 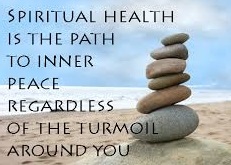 We work on our physical bodies by working out and eating right but how to we maintain “good spiritual health”? Ideally we should want our spirits to be full of peace. Achieving this is really done when we surrender and begin to live more intentionally. The process of understanding that in each of our lives there is a higher power guiding us through the ebbs and flows of life. it doesn’t mean we ignore our responsibilities or things that happen to us but it does mean that after we do what we are supposed to do, we can release, let go and trust. The spirit only thrives if we nurture it regularly. Nurturing our spirits gives us a greater sense of our life’s purpose and meaning. The result usually includes better moods, less anxiety, stress and negative thoughts. What brings you joy, hope and comfort? Why are you worth knowing? A healthy spirit is comprised of a sense of wholeness, knowingness and hope. Living a well-balanced and more meaningful and full life requires nurturing yourself on every level. Take a moment to journal on the following questions. As you answer them, refer back to your original post it notes. Do you notice any inconsistencies in what you want your spirit to be and what it actually is? Download your week 2 Workbook Today for this week’s journaling excercises. Download your Week 2 Workbook Today! The workbook includes all of the tools you need to complete this week’s assignment. Thank you for joining the Life Audit!!! Each Week, you will receive a workbook to assist you on this journey! Click Here to download this week’s workbook! The beauty of conducting a spiritual audit is the realization that you can truly enjoy life right now no matter what the circumstances may be. It is making a conscious choice to live each day with purpose and intention. This allows us to enjoy the beauty that life has to offer right now. Join me next week as we explore Relationships. For those who have joined the Life Audit Challenge, please share your thoughts with me. Are you discovering anything different? Is the Audit helping you in defining exactly what kind of life you want? Please send all comments and suggestions to me at sumofmanythings@gmail.com.